How do you protect your property budget when transferring money to France? Buying a property in France is an exciting prospect, but make sure you plan your finances carefully to ensure you don’t lose out on transferring money to France. Current political instability has also caused the markets to fluctuate wildly. It’s consequently more important than ever to protect your budget when buying abroad – or your house could be surprisingly expensive. 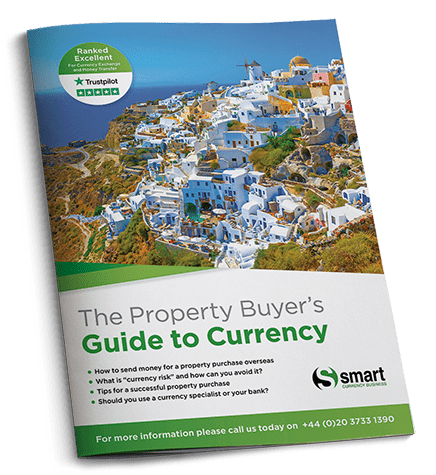 The Property Buyer’s Guide to Currency will provide you the platform that you need to make particularly informed decisions about your budget. The guide is produced by Smart Currency Exchange. We regularly hear particularly fantastic feedback from our France Property Guides readers about transferring money to France with Smart. Additionally, they are also ranked Number 1 for Currency Exchange and Money Transfers on Trustpilot, with over 1,000 5-star reviews from their clients. In clear and simple steps, it gives you a strategy for protecting your costs for your dream move to France.